Trail Mix is pretty pricey at the grocery store, but homemade is super simple to prep. Plus you can control the quality and proportions of the fruit, seeds, and chocolate you include. Prepare the easiest and tastiest of snacks with this simple Trail Mix Recipe with Fruit, Seeds, and Chocolate. It’s delicious on its own, atop yogurt or oatmeal, or baked into cookies. The arrival of Spring just beckons us to come outside. Once the clouds clear and the sun pops out, it’s time to hit the trail. And what better snack to take on a long hike or walk than trail mix? 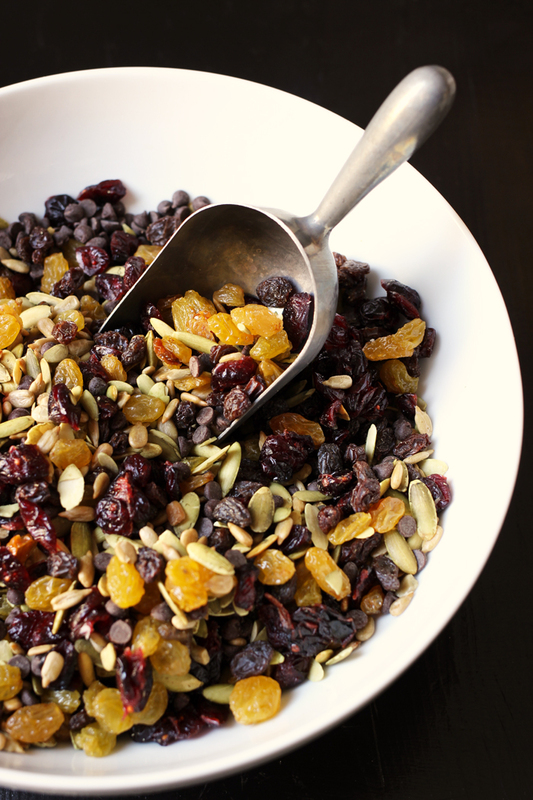 Bursting with nuts, fruits, seeds, and chocolate, trail mix packs a punch. Not only is it full of carbs and fiber which you need on the trail — and a little sweetness to boot — but it’s also easily portable and perfect for snacking. Or not necessarily portable, as my children ate this bowlful while my back was turned! How Do You Make Homemade Trail Mix? Since trail mix combines a little bit of everything, it’s great for using those odd bags of fruits, seeds, nuts, and chocolate that you might have stashed in your pantry. Talk about pantry challenge and spring cleaning all rolled into one. Do I Need To Add Nuts To My Trail Mix? Due to my daughter’s walnut and peanut allergy, I don’t usually add nuts into my trail mix like this nut free monkey trail mix. There’s too big a risk for cross contamination with most nut brands. However, I’ve found pepitas and sunflower seeds to add a nice crunch instead. 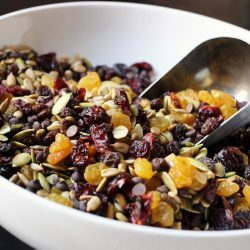 In this particular trail mix recipe, I use cranberries and two tones of raisins for the chewiness/eat-the-rainbow factor. Mini chocolate chips do the job of, well, chocolate, I mean sweetness. I was born in the 70s and well remember carob chips in our trail mix along with dried figs of which I am not a fan. Too hard and weird. This trail mix is super tasty and up with the times. Stock up on ingredients when they are on sale. When I find regular kitchen staples on sale, I buy a lot. I’m currently using a price book to track prices and that’s saving me money. For this recipe, keeping an eye on the price of seeds and dried fruit can help keep the price down. I always recommend buying generic when it comes to your dried fruit and nuts (if you are using them). Buying in bulk – It’s rare that I would buy a small package of dried cranberries. I usually buy the ginormous bag at Costco. Shopping the manager’s specials – I find all kinds of great deals on the clearance racks. mixing bowl – I love the contrast of ingredients against the white bowls. aluminum scoop – These are great for scooping bulk ingredients! measuring cups – My daughter is fascinated by the magnets that hold this set together. canning jars – Not sure I could live without these. plastic lids – or these! Something new here on Good Cheap Eats that I’m slowly rolling out is the option to rate the recipes you try. After you’ve made this easy homemade Trail Mix, I’d love for you to come back and tell me how you liked it. Be sure to give it a starred rating in the comments. Thank so much! 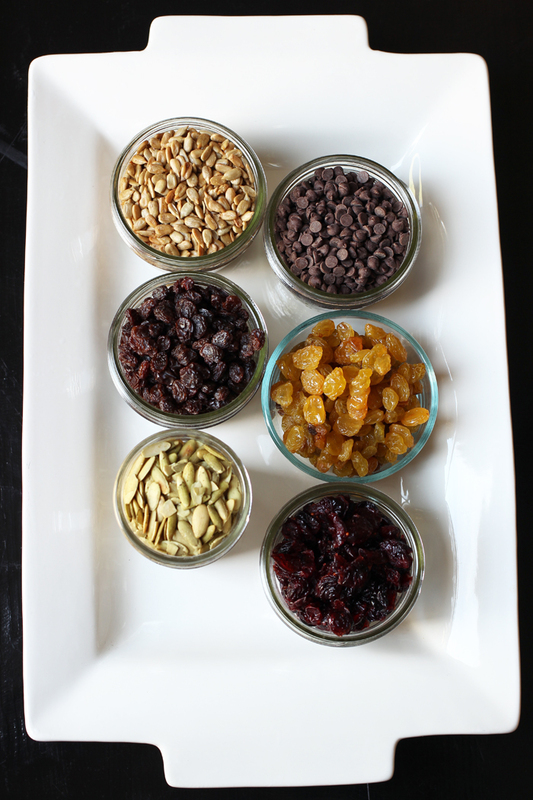 Prepare the easiest and tastiest of snacks with this simple Trail Mix Recipe with Fruit, Seeds, and Chocolate. It's delicious on its own, atop yogurt or oatmeal, or baked into cookies. In a large mixing bowl combine all the ingredients, stirring to distribute them evenly. Store in an airtight container, in a cool, dry place. Originally published March 21, 2011. Updated February 17, 2018. We’re nut free too, I’ve been using sunflower seeds in my granola bars for awhile. I just starting adding pepitas, although I do find them to be a bit pricey. Have you found a good frugal source for pepitas? @Danielle, I buy them at Trader Joe’s. But honestly, I don’t remember the price. I just know they were a lot cheaper than pine nuts. Holy cow! @Jessica, unfortunately we don’t have Trader Joes in Colorado. Oh, how I miss it. I wish Costco would carry seeds, because they’re nut prices are usually quite competitive. Pine nuts are ridiculously expensive, but my husband is allergic to all tree nuts including pine nuts, so I guess I don’t have to worry about those anymore. He can eat peanuts (I guess since those are a legume) so that’s always an option for us, but I’ve been leaving them out because they don’t want us to give the little one nuts or peanuts until she’s 3 because of my husband’s nut allergy. A few more months and then hopefully I can start using peanuts again. Not having food allergies of my own it’s been quite the eye-opener dealing with my husbands. I do keep a small stash of almonds for my oatmeal in the mornings, but that’s about the only thing anymore, I worry to much about cross-contimanation. @Danielle, did they specifically test him for pine nuts? Because my understanding is that they are really a seed. Check with his allergist first, obviously. Try a mexican grocery store if you have one nearby. I have found pepitas to be cheaper there. Great recipe, but you forgot the chocolate!!! What are pepitas? Where would you find them in north Ga? Pepitas are pumpkin seeds. I don’t know if you can find them there, but they’re not very uncommon, so I would think so. I couldn’t help but chuckle about a pnatry cleanup and leftover chocolate. Who has leftover chocolate? 🙂 We NEVER do! We’re nut free too. 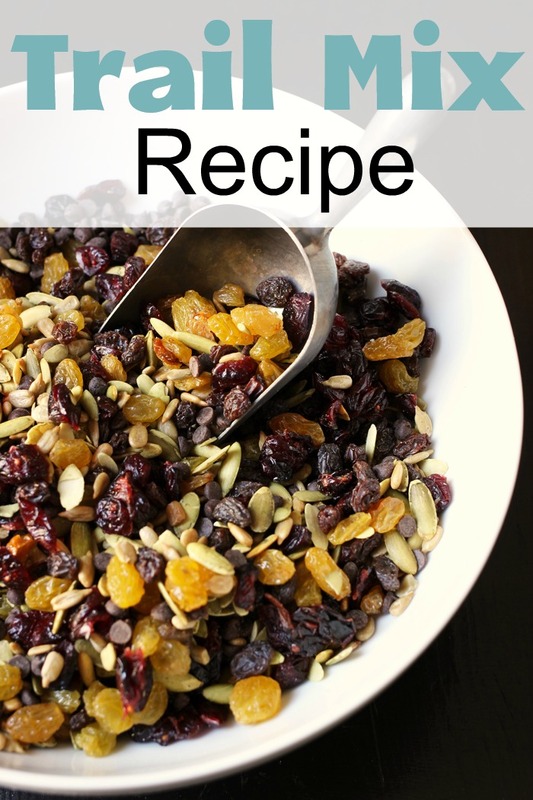 I do a similar trail mix but add shredded coconut, and dried cherries instead of two types of raisins. It’s delicious!! Those looking for pepitas you can order raw pumpkin seeds from Bob’s Red Mill website. I have never made trail mix from a recipe. When my kids were little I would simply start with a quarter cup of chocolate chips or M&Ms and started adding a mix of pretzels, cereals, nuts & seeds, and dried fruit from the cupboards. Consequently, the kids never had the same trail mix twice. Some combos worked better than others, but the kids never seemed to mind. True, you don’t really need a “recipe”, but it’s always nice to hear what combinations others use, I think. Love the idea of pretzels! YUM! For some reason, my people don’t mind this mix. Normally they are raisin-haters, too. I get you.